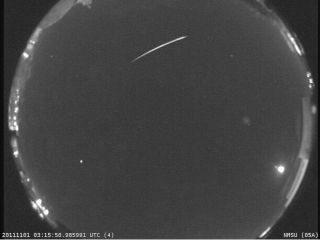 A still image of a North Taurid meteor that was captured at New Mexico State University. Skywatchers hoping to be dazzled by this month's meteor showers may be disappointed to hear that bright moonlight could steal the show. November marks the return of the annual Taurid and Leonid meteor showers, and while the Leonids have typically been one of the more stunning light shows of the year, both showers could be more subdued this year because of a bright moon, said Bill Cooke, head of NASA's Meteoroid Environments Office at NASA's Marshall Space Flight Center in Huntsville, Ala.
"The moon is going to mess with the meteor showers this month, just like it has messed with a lot of meteor showers this year," Cooke told SPACE.com. "That's good for lunar observers, but not for meteor showers." The annual Taurid meteor shower, which gets its name from the streaks that appear to radiate from the constellation Taurus, is a lengthy display that stretches from mid-September to mid-November. "North Taurids are weaker — the South Taurids are the stronger of the two, but they're listed as variable," Cooke said. "This year, I've seen eight South Taurids, but only three North Taurids so far. Hopefully that will pick up." Taking into account the increasingly bright moonlight, the Taurids should be visible to skywatchers in North America with clear skies. Meteors are often referred to as "shooting stars," but the streaks of light come from debris as it hits Earth's atmosphere and then burns up. The Taurid meteors are leftovers of the comet Encke, which produced some larger pieces of debris, which can streak across the sky as unusually bright meteors, or fireballs. "They are rich in fireballs, so with a little luck, you might be able to see some good Taurid fireballs," Cooke said. Next up on skywatchers' calendars will be the annual Leonid meteor shower, which is expected to peak the night of Nov. 17. "The moon is going to be a major interference, but we could see a rate of about 20 per hour," Cooke said. "Some models, including ours, indicate that particles may encounter Earth on Nov. 16 at around 5:30 p.m. EST [2230 GMT], where we could see anywhere from 100 to 200 meteors per hour. So, we could get a Leonid outburst, but unfortunately it is not favorably placed for viewing from the United States." So, while some people could get a nice preview the day before, the peak of the Leonids is still expected on Nov. 17, but Cooke is not predicting the outburst will be particularly strong. "We could see rates of about five meteors per hour," he explained. "If people want to see the Leonids, it might be good to watch the nights of Nov. 16 and 17. Instead of just going out one night, you might want to go out twice." Despite some alluring displays earlier this year, Cooke classifies the 2011 meteor shower season as somewhat underwhelming so far, largely due to the brightness of the moon during many of the showers' peaks. "The recent Orionids were kind of a surprise to me," Cooke said. "I like the Orionids a lot, and the recent Orionids were pretty nice as far as meteors are concerned. But, they weren't a knock-your-socks-off shower." But, there is good news ahead: December's Geminid meteor shower is generally one of the best displays of the year, and next year's forecast is already showing promise for good meteor shower viewing. Editor's note: If you snap an amazing photo of the Taurid or Leonid meteor shower and would like to share it with SPACE.com for a possible story or gallery, please contact managing editor Tariq Malik at: tmalik@space.com.